Last month, I had the pleasure of representing 23andMe at the Association for Molecular Pathology’s Science Educator Workshop in Austin, Texas. The workshop was a day-long event for local high school and community college educators, designed to advance their knowledge of topics in clinical molecular diagnostics and awareness of the molecular pathology profession. As a former high school biotechnology teacher, I always considered attending workshops during school hours a “necessary sacrifice”: necessary because I would hopefully be taking home relevant teaching tools, and a sacrifice because it was one less day of instructional time I had with my students. This was the first workshop I attended as a facilitator, not a participant. Having been on the receiving end of these types of workshops in the past, I wanted to make sure that the educators who took part in our 23andMe activities left feeling that it was worth the lost classroom instruction time. To do this, we designed activities that provided participants with new, relevant information and free classroom-ready activities that could be easily implemented. 23andMe is the first and only direct-to-consumer genetic service available that includes reports that meet FDA standards for being scientifically and clinically valid. 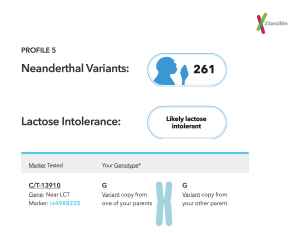 23andMe launched a new experience in October, and it now includes three new categories of genetic reports in addition to ancestry: carrier status*, wellness and traits. Meeting FDA standards also means that our reports were influenced by user comprehension studies to make them easy to understand by individuals or students (ninth grade and above) with little or no genetics background. Our genetic reports and the scientific information provided in them can be powerful teaching tools for individuals learning about basic DNA concepts and about themselves through th eir own DNA, but they can also facilitate many relevant discussions in classrooms. 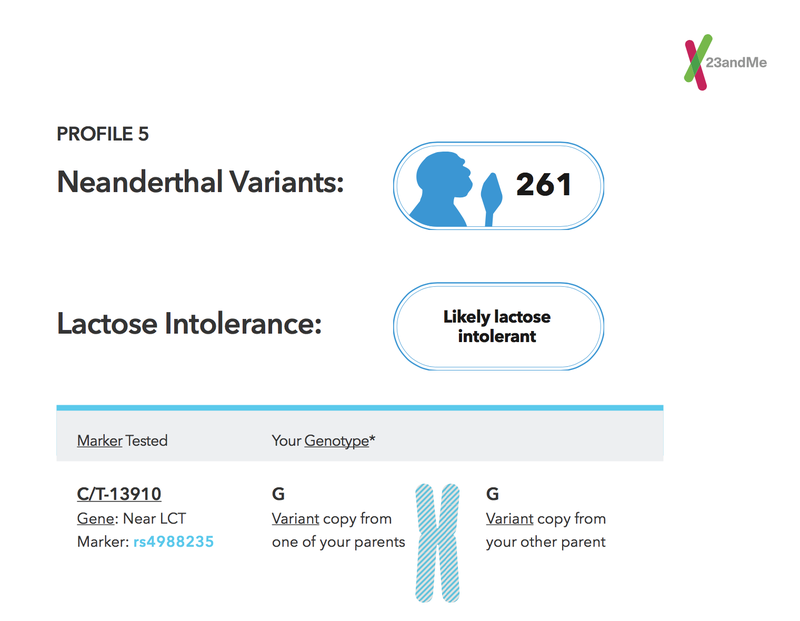 To show participants how our example genetic reports can be used in classrooms to teach key concepts in an engaging way, our Education Team created two 15-20 minute activities: the first on Neanderthal ancestry, and the second on lactose intolerance. Although these activities were designed for educators who participated in the workshop, they can easily be used in the classroom as well. Part II: Neanderthal Variants – It is theorized that the ancestors of modern humans interbred with Neanderthals in Europe and the Middle east, then migrated across Europe, Asia, Australia and the Americas, away from Africa. This is why it is expected that those with Sub-Saharan African Ancestry typically have fewer Neanderthal variants than people with ancestry from other parts of the world. This concept was reinforced in Part II of the Neanderthal Ancestry Activity, with a manipulative designed to test this understanding. Part I: Comparing Profiles – Participants organized the phenotypes and likely genotypes of 12 individuals with diverse ethnic backgrounds into a table. From this table, some general observations can be made, such that of the individuals analyzed, those with higher percentages of Middle Eastern, North African, and Asian ancestry were more likely to have lactose intolerance, in comparison to those with mostly European ancestry. Part II: Genetic and Non-Genetic Factors of Lactose Intolerance – The second part of the Lactose Intolerance Activity uses information found in the 23andMe Lactose Intolerance Wellness Report to explore how the ability to digest lactose can be influenced by both genetic and non-genetic factors, such as other genetic variants, ethnicity, environment and age. These activities and other free resources can be found on our 23andMe for Educators website. If you have a lesson, or an idea for a lesson, that would benefit your students or other educators, please don’t hesitate to contact us at educators@23andMe.com.